Prime Minister Perry Christie has announced initial policy actions that he claims will allow the government to arrest the growth in the debt to GDP ratio by 2014/15, and begin a gradual reduction in the ratio to just over 50 per cent of GDP by 2016/17. Prime Minister Perry Christie has announced initial policy actions that he claims will allow the government to arrest the growth in the debt to gross domestic product (GDP) ratio by 2014/15, and begin a gradual reduction in the ratio to just over 50 per cent of GDP by 2016/17. To achieve these two goals, recurrent revenue will be significantly and structurally enhanced through a wide range of measures, the Prime Minister said during the 2012/2013 Mid-Year Budget Statement on the six months ending December 31, 2012 at the House of Assembly, February 25, 2013. The Prime Minister said that the government is establishing a Central Revenue Agency to strengthen the efficiency and effectiveness of revenue collection across a number of major taxes. Christie added that the government is implementing a broad tax reform package that includes the introduction of a value added tax (VAT) in July 2014. He also said that the government is committed to wide-ranging reforms of the property tax administrative system that will add one per cent of GDP to recurrent revenues by 2016/17. The government is undertaking a comprehensive customs reform and modernisation programme, assisted by the Inter-American Development Bank that will add revenues equivalent to 0.5 per cent of GDP. Prime Minister Christie said the new Customs Management Act will be brought into Force July 1, 2013, providing a modern legislative framework for Customs operations. He said that the government is taking such policy actions to return the public finances to a more desirable position. Prime Minister Christie noted that in December 2012, Moody’s announced a downgrade in the country’s credit rating along with a negative outlook. He said as the country faces the prospects of higher rates of interest on any future borrowings at a time when the country’s annual interest expenses already exceed $200 million and consume roughly one out of every seven revenue dollars. 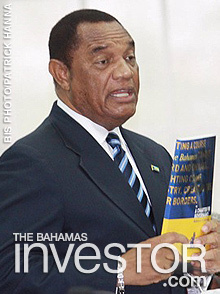 During the 2012/2013 Mid-Year Budget Statement at the House of Assembly, February 25, Prime Minister Perry Christie said the International Monetary Fund (IMF) forecasts that the Bahamian economy will grow by 2.7 per cent in real terms in 2013.